Libby and Wayne Hancock hosted a Hope Scarves event at their Rolling Fields home on Oct. 12. Guests enjoyed the beautiful outdoor setting under tents and lights while they bid on auction items and raised money for breast cancer awareness and research. Lara and Jason MacGregor were anxiously awaiting the birth of their second child, another boy. It was during Lara’s 7-month routine Obstetrician appointment when her life would change forever. The discomfort she was experiencing in her left breast was in fact stage II breast cancer. Because of the type of cancer, her Oncologist recommended Lara to begin treatment immediately. Style Blueprint wrote a wonderful piece about Lara. See below for a wonderful question and answer session between Lara and author Heidi Potter. I had a lot of questions for Lara, questions that I have always kept inside, that I have been too embarrassed or nervous to ask. They were hard to ask and really hard for her to answer, probably because they brought her back to a place of complete vulnerability. I had interviewed her before when she was a FACES of Louisville, but this interview was much more intense, and I appreciate her complete honesty. A friend invited me to their wonderful fundraiser last fall. I took along several scarves with my stories attached. 2. How did it feel to share your story and encouragement to others when you donated your scarves? It felt great! 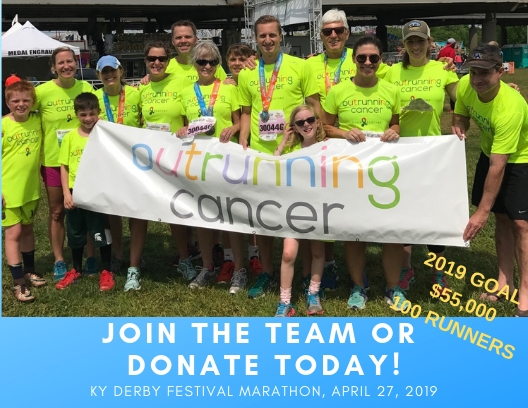 One thing I was determined to take away from my experience with cancer was my ability to help those who are starting the journey. I was so proud of myself that I made it through and I wanted to pass that confidence on to others. Donating my scarves to Hope Scarves was a perfect outlet through which to do that. I found humor to be empowering to me throughout my experience with breast cancer. It gave me control over the situation and helped me handle it with my children, Camille and Campbell. I remember one day in the car I was hot and took my scarf off. At first they were a little embarrassed. I told them to keep track of the number of people who were staring at me. By the end of the trip my son was saying, “Oh, oh, mom, that guy is looking at you. That makes ten!” We were all laughing about it. Also, fortunately for me, I had several friends who were going through it at the same time. I could see from some what I had ahead of me and help those who were behind me in their treatments. I feel great these days. I just passed the two year mark for the end of my chemo and radiation. Both of my children play soccer for Kentucky Fire Juniors teams. We go to A LOT of soccer games but I love it. I work as a dental hygienist and enjoy meeting new people every day. I use my position as a health care provider to spread awareness of breast cancer and regular screenings. I can’t think of a more thoughtful gesture than to send a Hope Scarf to someone who is experiencing hair loss due to cancer treatments. It represents so much more than just a scarf. I would tell them to definitely do it. The recipient will be so happy to know that they are connecting with someone who has walked in their shoes. I’ve always wanted to travel across the country in an RV. One thing I try to remember after cancer is that you never know what someone is going through so try to be kind to everyone. 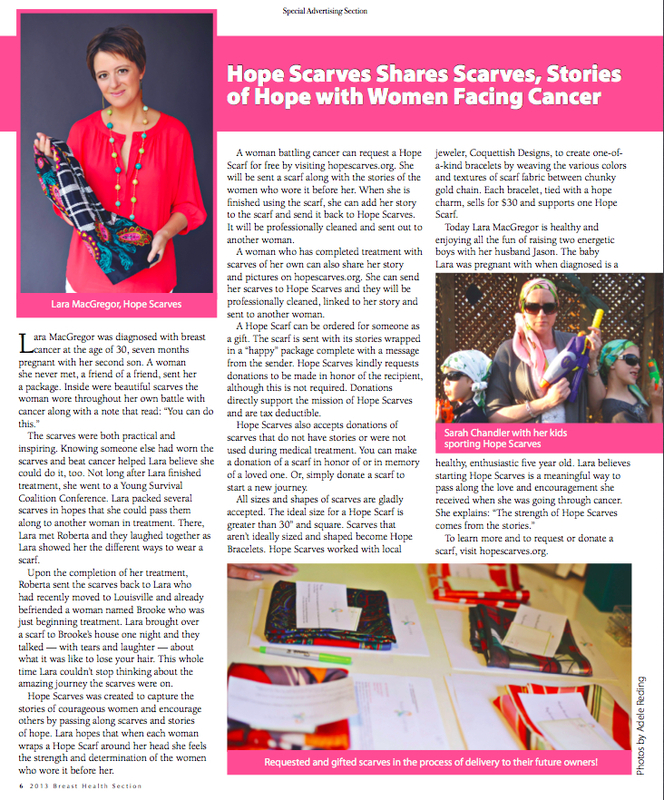 As a breast cancer patient I had a scarf that alerted people to what I was experiencing. Not everyone has a scarf to tell you they are having a rough time. Next time someone is short with you, try to remember that and be kind.